If you want a unique engagement ring with an interesting history, then an estate ring may be perfect for you. Finding the perfect ring may be a bit more challenging than walking into your local jewelry store and picking your favorite, but with some helpful shopping tips and a good idea of what you want, you'll end up with a ring that you'll love for many years to come. Is an Estate Ring Right for You? Before you begin your search for the perfect ring, it's important to consider some of the ins and outs of estate jewelry. Estate engagement rings have been owned and loved by other people, and some can be quite old. This type of engagement ring isn't for everyone, but many people love owning a ring with a story of its own. An estate ring is not new. This piece has been owned, and most likely worn, by at least one other person. It may show minor signs of wear or have engraving of initials or a personal message. In most cases, the jeweler selling the ring will have restored it to great condition. If you want a brand new ring, an estate ring is not the right choice for you. However, if you like having a ring with a bit of its own history, this can be an excellent option. Sometimes, you'll pay less for an estate piece than you would for a comparable new ring. This is especially true if you're dealing with a fairly contemporary piece or even a vintage example. Because the ring has been owned and worn by someone else, it represents a cost savings for many couples. However, antique estate rings or those marketed for their history may actually be more expensive than modern options. If you're on a budget, consider a pre-owned ring. Your dollars will sometimes stretch further, allowing you to get a larger gem or save some of your money for another purchase. However, check the cost of a comparable new ring to see if you're getting a good deal. Generally, estate rings are one-of-a-kind or very close. You won't see your ring on anyone else's finger, since it has likely been decades since it was produced. Their unique style makes estate rings ideal for brides who want something a little different for their engagement jewelry. You can purchase classic styles like solitaires, but you'll also see flamboyant designs that will set your ring apart. Because estate rings are pre-owned and unique, shopping for them is a bit more complicated than buying a brand new piece of jewelry. However, like any major jewelry purchase, a little research and preparation can help you ensure you'll end up with a beautiful engagement ring. Before you fall in love with a ring that's out of your price range, it's important to identify you budget. These rings can cost anywhere from a few hundred dollars to $10,000 or more. Knowing what you can afford to spend will help you narrow down the choices as you shop. Buying a pre-owned engagement ring doesn't limit your choice of styles. In fact, you'll see rings from every era and featuring every gemstone you can imagine. Prior to starting your search, take some time to consider what you love. Do you like antique rings with filigree and delicate engraving? Do you prefer modern styles with sleek lines and simple settings? Perhaps you want a sapphire or ruby, or maybe you prefer the classic elegance of a colorless diamond. Understanding what you love will make it easier to find your perfect engagement ring. When it comes to shopping, you have a couple of options. You can shop for your ring locally at estate jewelry stores and antique shops, or you can shop online. Shopping locally allows you to see the ring in person and try it on before buying. However, you'll have more choices for the style of your ring if you shop on the Internet. Long's Jewelers - Offering hundreds of gorgeous pre-owned rings, Long's is a great place to start your search. You'll see everything from stunning Art Deco engagement rings to more contemporary pieces by designers like Roberto Coin and Marlene Stowe. Prices start around $400, and there are many rings in the $3,000 range. This store accepts returns within 30 days. Lang Antiques - Another great resource for rings from past eras is Lang Antiques. You'll find over 700 gorgeous rings on this site, which specializes in rings from the Edwardian and Art Deco periods. In addition to spectacular diamond rings, you'll find a great selection of ruby and sapphire pieces. Prices start at under $1,000, and there are many rings around $4,000. You have ten days to decide if you want to return your ring for a full refund. Era Gem - Specializing in estate jewelry from a variety of time periods, Era Gem has over 500 engagement rings in stock. Choices range from mid-century yellow gold diamond solitaires to Tiffany engagement rings and Art Deco beauties with emerald-cut diamonds. If you're looking for something unique, you can't skip this site. Prices start under $1,000, and there are pieces that sell for over $60,000. Era Gem has a 60-day guarantee for all rings. Whether you shop online or locally, it's important to have your ring appraised by a professional. It can be very difficult for a lay person to tell whether the gems in your ring are authentic and of the quality specified, so you need an expert to look at your ring under magnification and give you an official appraisal of its value. 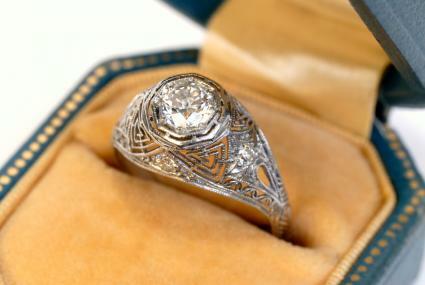 An appraiser can also verify that your ring is from the era specified by the jeweler and that it is in good condition. In addition, you can use the appraisal for insurance purposes if you decide to purchase the ring. Finding an appraiser is easy. You can contact local jewelry stores for recommendations, or you can call your insurance provider for other local professionals. Choose an appraiser who is a graduate gemologist. You can also find a qualified professional through the American Gem Society. If you want an engagement ring that has symbolized the love of other couples before you, an estate ring is the perfect choice. You can find any style you love, sometimes at a cost savings over new jewelry. In addition, your ring will be uniquely yours.